Together with its French M&A International partners, Aileos Finance, DeSilva+Phillips announces that our client Alenty, a leading advertising viewability company offering solutions for advertisers and agencies to measure and optimize online branding marketing, has been acquired by AppNexus. Alenty was founded in 2007 by CEO Laurent Nicolas and CTO Nicolas Thomas. The company, which has offices in Paris and the UK and key clients throughout Europe, was the first to measure viewability, determining if and how long a display advertisement is seen by an audience when it is served. The goal is to ensure buyers get true value for their money; advertising dollars do not support sites that run non-viewable ads; and publishers who run viewable ads do not lose money to publishers that run non-viewable ads. 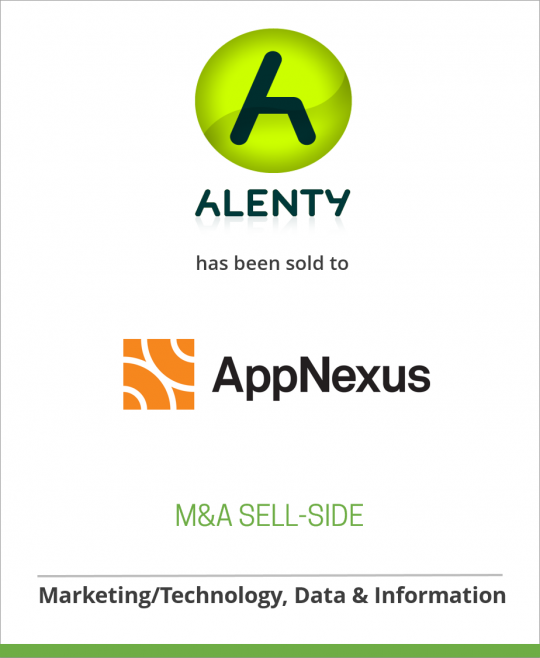 Alenty has been part of the AppNexus App Marketplace since 2011. The Interactive Advertising Bureau (IAB) and Media Rating Council (MRC), together with a working group that included a wide range of industry stakeholders, recently developed guidelines that define a viewable impression as one in which at least 50 percent of a display advertisement is in view for a minimum of one second. According to Alenty, more than half of impressions are not in-view on many websites. AppNexus serves buyers and sellers of Internet advertising in 53 countries and has an existing office in Paris, as well as nine others around the world, including those in London, Hamburg, Sydney and Singapore. Over the course of 2013, AppNexus grew revenue significantly while transacting more than $1 billion of advertising spend across its global platform. AppNexus is a technology company that provides trading solutions and powers marketplaces for Internet advertising. Our open, unified, and powerful programmatic platform empowers customers to more effectively buy and sell media, allowing them to innovate, differentiate, and transform their businesses. As the world’s largest independent ad tech company, AppNexus is led by the pioneers of the web’s original ad exchanges. Headquartered in New York City with ten global offices, we employ hundreds of the brightest minds in advertising and technology who believe that advertising powers the Internet. For more information, follow us at @AppNexus or visit us at www.AppNuxus.com.